*Free at Sea is available on all sailings and for all categories including IX, OX, BX and MX (Sail Away Categories) but applicable terms vary for certain ships and sailings. Upgrade charge depends on cruise length. 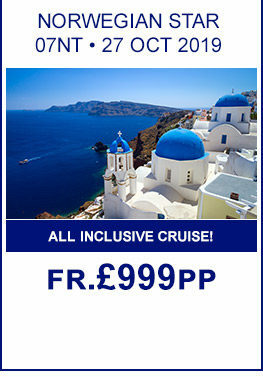 £99pp is applicable for cruises of 7-9 days. Applicable to 1st and 2nd guests sharing a stateroom only (unless otherwise stated) and not valid for 3rd or 4th guests sharing. Single occupants of stateroom paying 200% of voyage fare qualify. 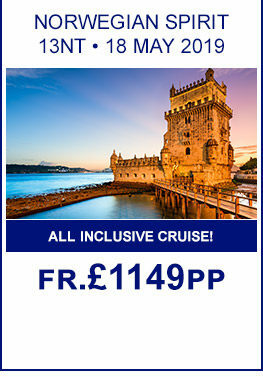 Guest cannot substitute or customise this offer and all guests in stateroom must choose same benefits. ** Amount of minutes subject to the length of the cruise. ^ Number of meals subject to the length of the cruise. 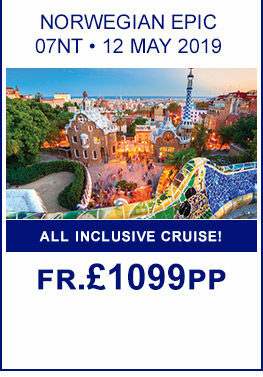 #Select sailings only. 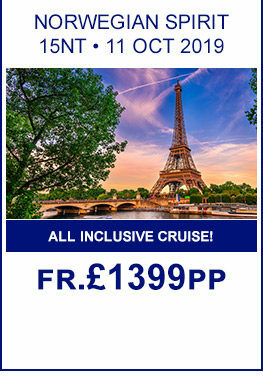 Take a look at our top 4 offers with Norwegian Cruise Line! Cruising with Norwegian Cruise Line you’ll experience the ultimate in freedom and flexibility at sea. Savour culinary sensations with the freedom to dine where and when you want, catch award-winning entertainment and enjoy endless activities. There’s a world of cruises to choose from and for the first time ever there are six ships in Europe in summer 2019, including Norwegian Pearl sailing from vibrant Amsterdam to northern Europe and in the Med. Spoilt for choice? Absolutely! Kid's Crew for 2-12 year olds provides loads of fun and safe activities for the younger kids including treasure hunts, pizza making, video arcades and so much more. For the teens there is Teen's Crew with all the latest technology to keep them entertained including Nintendo Wii and Playstation as well as teen discos and various sports and activities. A wide range of bars and lounges to suit all moods from the poolside cocktail bar to the lively sports bar or the sophisticated champagne bar. West end style shows, live music, nightclub and casino. Despite the line’s name, the Norwegian Cruise Line fleet don’t stick solely to Scandinavia (although a cruise around the Norwegian Fjords is one of the world’s great holiday experiences). The 15 stunning ships of the fleet journey far and wide, from the charming cities of the Mediterranean to the stunning shorelines of Australia. Continuously updating their itinerary lists, Norwegian Cruise Line can take you to some of the world’s more unusual cruise destinations, from Cuba to Alaska. The Norwegian Cruise Line team have gone to great lengths to fill each and every one of their itineraries with delightful port visits and excursions. Whether you want to explore ancient cities packed with heritage and history or simply unfurl your beach towel on perfect, white sands—Norwegian Cruise Line will have the ideal itinerary for you.